Crabeater seals resting on an ice floe in the Western Antarctic Peninsula. The rake-like scars seen on the body of the far seal are most likely from leopard seals, their main predator. Image credit: Dan Costa, UC Santa Cruz. Crabeater seals are the most numerous of the world’s seals and are widely distributed along the pack ice that surrounds Antarctica. Their fur ranges from dark brown to silver. 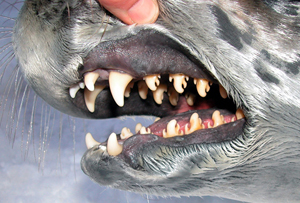 They often have linear, rake-like scars on their bodies caused by leopard seals, their main predator. Adult crabeater seals are about 2.6 m (8.53 ft) long and can weigh up to 225 kg (496 lb). Despite its name, the crabeater seal feeds mainly on krill, small, shrimp-like crustaceans. Their specialized teeth are used to strain prey as the seal gulps seawater. They forage primarily at night, resting on ice floes during the day. Crabeater seals are unique among the phocid seals in that they form “family” groups consisting of an adult female, her pup, and an adult male. Females give birth to a single pup. A male usually joins a pregnant female shortly before or after the pup’s birth. He remains with the female on the ice until after the pup is weaned, at which time mating occurs. The seals breed on the ice from early October to mid-November. During the time a family group is together, the adult male defends the female and pup from other adult males and predators. Male crabeater seals are especially vocal during the breeding season, producing two types of calls, the groan-like “low moan” call, and the “high moan” call. The low moan lasts about 2.5 s with a frequency range of 260-2500 Hz. It rises to a constant frequency and decreases at the end. The high moan call is characterized by a brief down sweep followed by a series of short pulses. This call lasts about 2.6 s with a frequency range of 1000-4900 Hz. Crabeater seals have very specialized teeth. Multilobed teeth interlock to strain prey as the seal gulps seawater. Despite its name, the crabeater seal feeds mainly on krill, small, shrimp-like crustaceans. Image credit: Dan Costa, UC Santa Cruz. As males remain with females and their pups during the breeding season, it is thought that they do not need to vocalize to attract a mate. However, they may need to communicate their status, and possibly compete, with rival males. Crabeater seals appear to respond to distant groans with their own low moans. 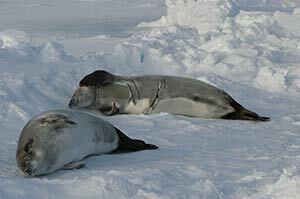 Crabeater seals have been found to produce sounds outside the breeding season. These sounds include groans, whistles, screeches, and grunts. The function of these sounds remains unknown. Australian Antarctic Division, Crabeater Seals. National Marine Mammal Laboratory, Crabeater Seals. NOAA Fisheries Service, Crabeater seal fact sheet. Sea World Animal Bytes, Crabeater Seal.